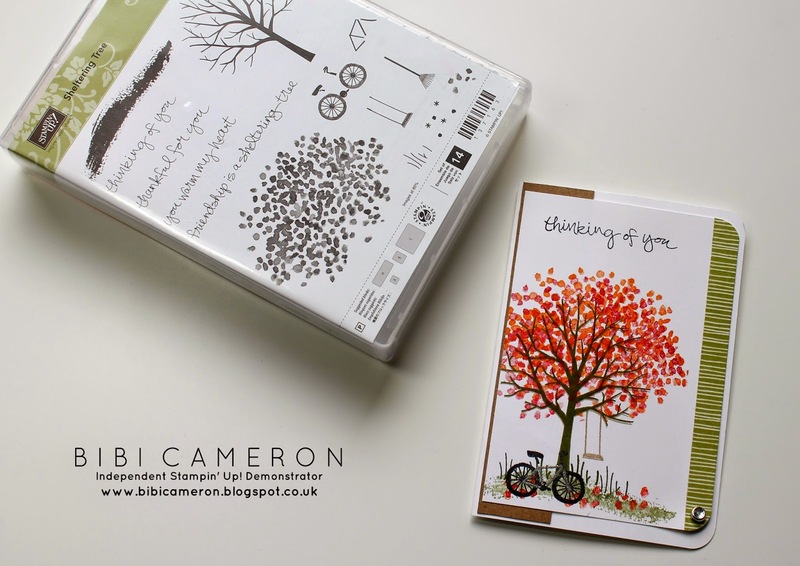 Sheltering Tree Stamp Set is one of the best selling products of the Spring/ Summer Catalog 2015 and it was out of stock on a number of occasions when I tried to place orders. I wrongly thought that I shouldn't get it . I certainly would regret not having it as is not only stunning but also versatile and easy to work with... People love Sheltering Tree! and now I know why. It is easy to use and can help you make something nice in record time. 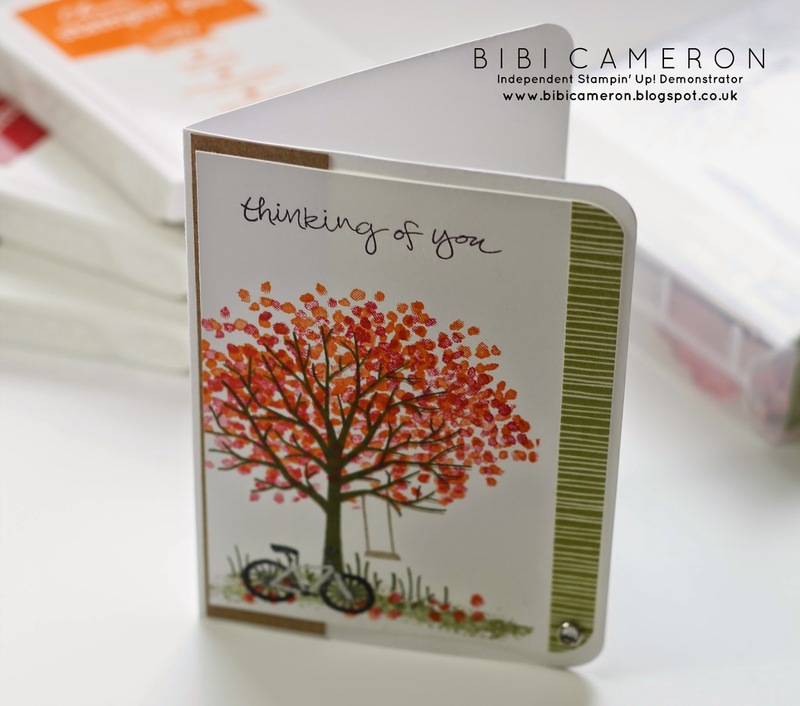 ...Grab any ink to add colour to the leaves and you will get different seasonal scenes. Do not add leaves to the trunk, use a bit of embossing powder and make a wonderful simple Christmas card. 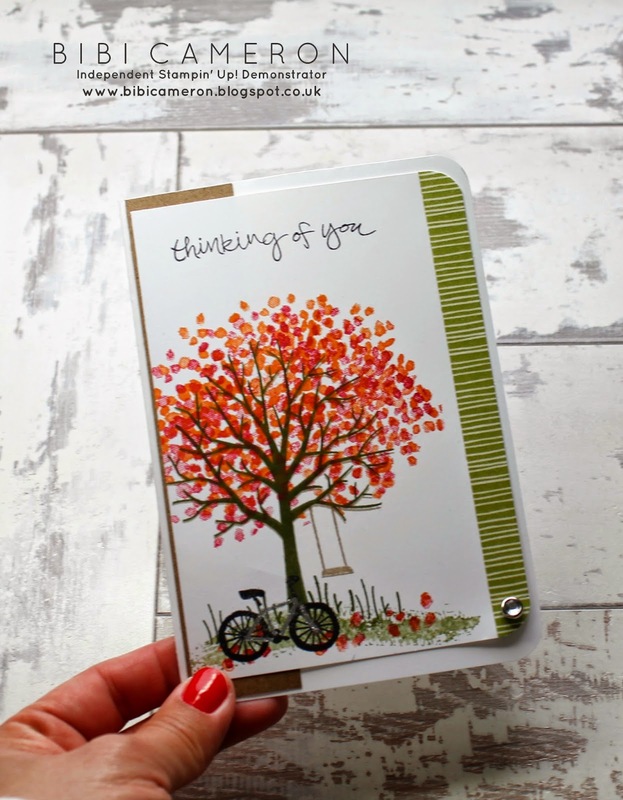 Use the bike of the stamp and make any occasion cards, stamp on fabric to make small and cute accessories, use the brush to make tiny halloween tags.. and keep going!!! Each of the 14 clear stamps in this set can be mixed with the stamps in other sets to make unlimited different project designs. This is an all occasion card made with whisper white card stock. 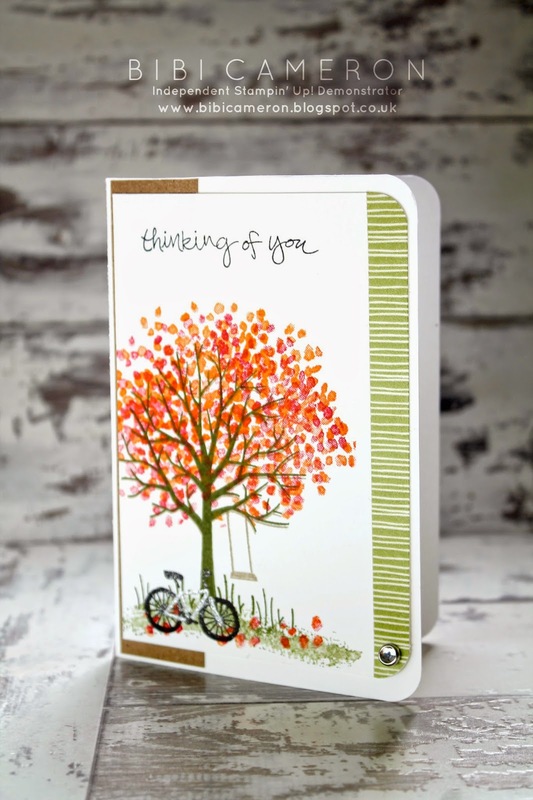 I stamped the trunk tree with Sand Sahara ink and double stamp using Mossy Meadow ink. For the leaves I used real red and Pumpkin Pie inks. I double stamp the leaves, moving the stamp a little bit so both inks can be seen. I stamped the bike with Jet Black stazon and for the bike chassis I used Versamark clear ink to emboss with silver emboss powder. To embellish and add some accents I used : the green striped washi tape from Santa Co. Designer washi tape pack, a diamond brad, and a piece of 1 1/2 x 5 3/4" kraft card stock. Check out the list of materials I have used to make this project and click on the images below to buy 24/7!